At Jet Skis Key West we offer distinctive tours and water sport packages for your delight and satisfaction. We make everything on this island easily accessible and very doable. Now you can experience Key West, Florida from a new perspective when you go on an adventure with Key West Parasailing. This awesome ride will give you a bird’s eye view of this beautiful and naturally rich island. Witness the blue waters and the lush greens from above. You can even try to spot elusive sea creatures as you fly high over the Key West Bay or the Atlantic Ocean. You can ride solo or buddy up with a loved one and experience a different view of Key West together. You do not need to be an expert athlete nor a great adventure seeker to be able to enjoy this activity. 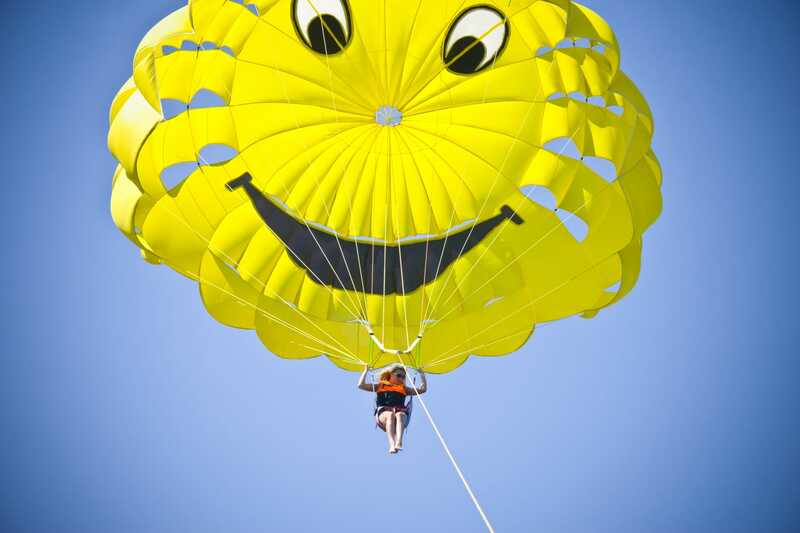 Once you book with Key West Parasailing, you have nothing else to worry about. You just need to board our well-maintained boat and clip into our top-of-the-line parasailing gear. Don’t worry. A quick orientation will be given before you set sail. From the boat you will gradually lift off until you reach the altitude of 300 feet. Take in the panoramic view of Key West from above and just relax for the 20-minute ride. This activity is open to all ages from kids to adults. The weight capacity is broad so the ride can accommodate adventure seekers of all sizes. The parasail has a 90-pound minimum weight requirement for a solo ride and a maximum 500-pound limit for a tandem ride. You can ride with your kids or your friends – the options are endless. You can even increase the level of excitement by taking a dip in the water while parasailing. Yes, you can either stay dry or get wet before you are reeled back onto the boat. You just need to inform our captain or guide before you lift off. This exciting activity is available every day and tours start every hour. You can even choose the late afternoon schedule to have a better view of Key West’s sunset. It is highly recommended to make early arrangements and book with Key West Parasailing prior to your visit to Key West to ensure your preferred schedule. Set aside one hour of your day for this activity. This includes the boat ride and the parasailing activity. As soon as you book with us, you will receive a confirmation letter with the address and map of the port where you will board the boat. Just bring this confirmation letter 30 minutes before the scheduled departure and the rest will be taken care of by Key West Parasailing. Also, put on some sunscreen, bring a towel and wear your bathing suit because you might just want to take a plunge after parasailing. So what are you waiting for? Gather up your friends and family and plan a trip down to Key West Florida to experience a thrill from 300 feet above ground. Use our secure online booking system to make reservations now.